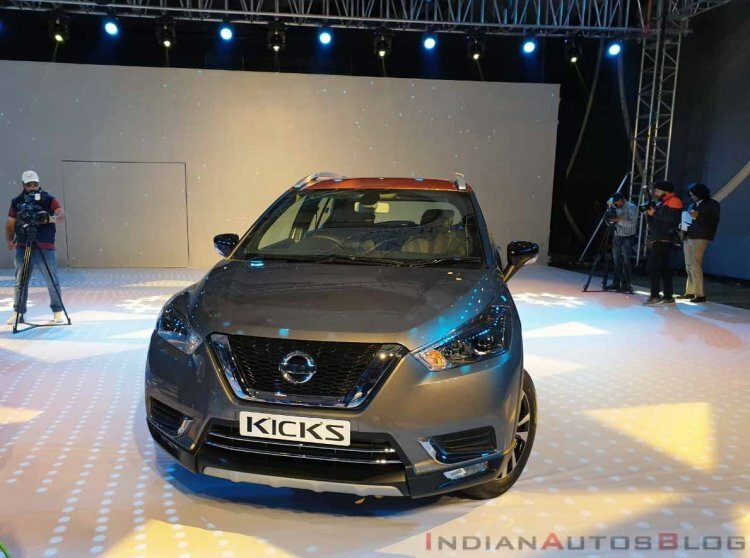 The Indian-spec Nissan Kicks has been introduced at a starting price of INR 9.55 lakh*. The new model offers petrol and diesel engine options and is available in four trims - XL, XV, XV Premium, and XV Premium+. The standard equipment list for the Nissan Kicks includes six-way adjustable driver’s seat, LED DRLs, power windows, power-adjustable wing mirrors with integrated turn indicators, automatic climate control, rear AC vents and a Bluetooth, USB and Aux-enabled audio system with four speakers. The top-spec XV Premium+ trim offers an 8.0-inch touchscreen infotainment system that supports Android Auto and Apple CarPlay, a telematics-enabled smartwatch, steering-mounted controls, automatic LED headlamps, leatherette upholstery, cruise control, push-button start and automatic wipers. The standard safety kit includes dual front airbags, ABS with EBD, rear defogger, and rear parking sensors, while the top-spec grade even offers four airbags, hill-start assist and rear fog lamps. The India-spec Nissan Kicks has gone on sale with two engine options - 1.5-litre H4K petrol and 1.5-litre K9K dCi diesel. The former produces 106 PS/142 Nm, while the latter outputs 110 PS/240 Nm. Transmission options include 5-speed manual and 6-speed manual units for petrol and diesel engines, respectively. The petrol motor offers an ARAI-certified fuel efficiency of 14.23 km/l, while the oil-burner offers 20.45 km/l (XL) and 19.39 km/l (XV/XV Premium/XV Premium+). The Nissan Kicks is available in 7 single-tone colour options - Pearl White, Blade Silver, Bronze Grey, Fire Red, Amber Orange, Deep Blue Pearl, and Night Shade, and 4 dual-tone paint schemes for top-spec trim - Fire Red and Onyx Black, Bronze Grey and Amber Orange, Pearl White and Onyx Black, and Pearl White and Amber Orange. Nissan India is offering 27 accessory categories that offer add-ons that are tailor-made as per customer requirements. The accessories come with a 1 year/20,000 km warranty. The new Nissan Kicks has generated a great amount of curiosity and excitement among the customers. It is a complete vehicle package with an exceptional combination of intelligent technology, class-leading premium-ness, intelligent choice of ownership, personalization. The maintenance package is best-in-class and offers a hassle-free ownership experience. We are confident that with its progressive SUV design and advanced technology, as well as many best-in-class propositions, the Nissan Kicks will stand out in this competitive SUV segment in India. The prices are inclusive of a 3-year warranty with road-side assistance and a maintenance package. The Nissan Kicks is even available through 'Intelligent Choice of Ownership' subscription model that enables the customer to drive home the SUV without any downpayment. The monthly subscription is inclusive of insurance, maintenance, and 24x7 roadside assistance. As per the company, this ownership model provides a vehicle-running cost of INR 11/km. The new model rivals the Hyundai Creta, Maruti S-Cross and Renault Captur.